As you may already know, since April 2017, the FAO - AGROVOC multilingual thesaurus has been updated on a monthly basis. 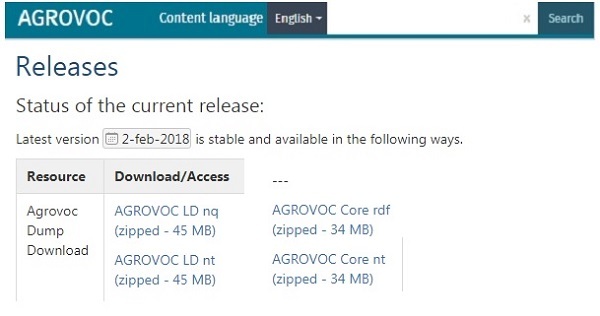 AGROVOC team takes this opportunity to inform you about the AGROVOC February 2018 release (Core & Linked Data) available here. covering (in up to 30 languages) topics related to food, nutrition, agriculture, fisheries, forestry, environment and other related domains. The AGROVOC Team would like to express its gratitude to all AGROVOC Editors who contributed to this new AGROVOC release and, of course, to all AGROVOC Users ! We look forward to another exciting AGROVOC year ahead of us.